While I am loathe to use the phrase “go-to-pattern,” I beg to report that whenever there are large sand eels around, Ken Abrames’ Big Eelie is my go-to pattern. The Big Eelie differs from 95% of other sand eel flies in that it is not an attempt to carbon copy the bait. Those legions of epoxy- and tube-bodied flies with eyes certainly work, but you can get away quite nicely with something far more impressionistic (if that’s your fancy) like the Big Eelie or Ray Bondorew’s Marabou Sand Eel. 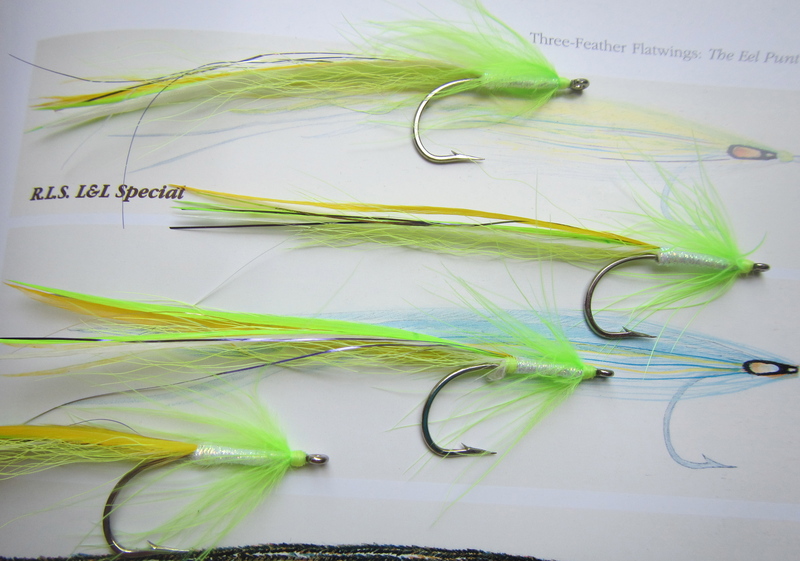 The classic Big Eelie is a four-feather flatwing/soft-hackle hybrid; it’s colors are white, yellow, olive, and blue. I’ve discovered over the years that the Big Eelie works in all kinds of color schemes. One of my favorites is taken from Ken’s three-feather flatwing, the L&L Special. This tart mix of yellow, fluorescent yellow, white, and chartreuse shines on sand flats, day or night. Tail: A white saddle, under one strand each of gold and silver flash, under two chartreuse saddles, under two strands purple flash, under a yellow saddle. Collar: 2-3 turns chartreuse marabou, tied in by the tip. Tying notes: Sand eels are a slender bait, so make your saddles about the width of a pencil. You don’t want a flaring broom shape for the platform, so likewise make it slim, and take the bucktail from near the tip of the tail. All the saddles are tied in flat. The marabou adds the magic here, as it veils the body when wet, creating movement and an almost glowing effect. Feel free to play around with different colors on this pattern; some of my favorites are blue/black/purple and white/pink/olive. Stripers love them all. I like to tie this fly about 4 1/2 inches long. To fish for stripers ‘round the clock. Most tasty with an IPA. Alas! Fly gone. A freakin’ blue. I moved to fish another spot. In horror when my line went slack. You’re kidding, right? She broke my hook! On older, tarnished, fragile metal. Dear Lord, can I please land a fish? But he jumped off ‘fore we could greet. I wondered to myself, what’s worse? No bites or losing fish (then curse)? Striped bass instead of eggs de goose. Besides, I was cold and had to pee. Just one more bass! I so did plead. Time for us to call it, quit. To fill an empty stomach’s quakin’. The only question now is – when? 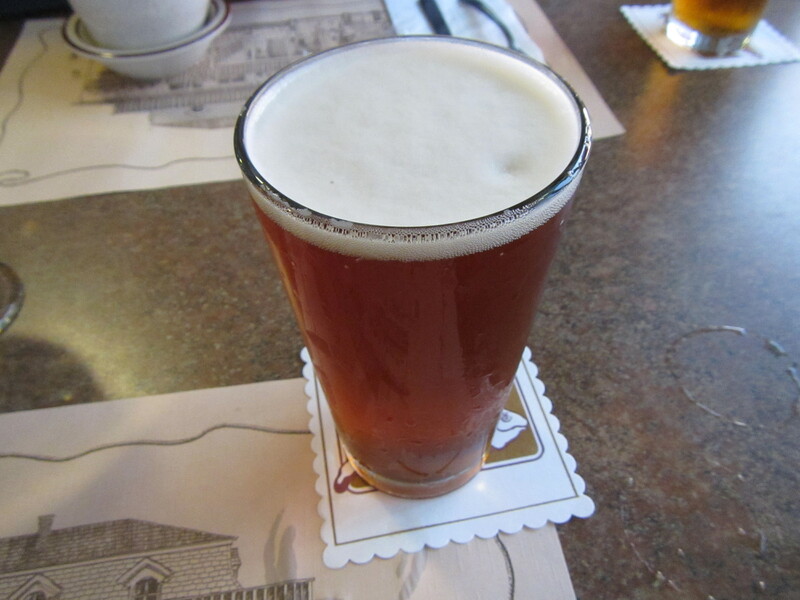 After: Coaster and friend, a pint of Fisherman’s IPA. Delicious, and a total hop bomb. 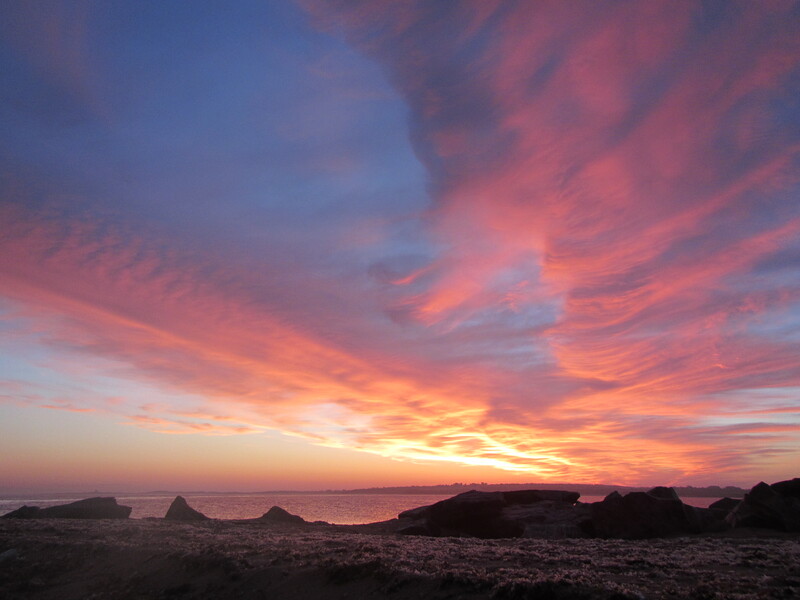 Being a night owl, I usually miss sunup. Darn pretty, this one. You’ve been officially warned, sailor. I had taken about six steps into the brook when I fell in. A poor foothold, a little water ballet in a desperate attempt to regain my balance, then flat on my seat, left forearm soaked and a shot glass-worth of water into my waders. Well, I thought, things could only get better. They did. The creek was up, but at a perfect medium-high level, almost imperceptibly tinged, and running at a cool 63 degrees. What’s more, the skies were a grey block of granite. Rain was coming. But for now, it was just me, the woods, the brook, and the trout. How you can tell it’s mid-June in the Connecticut woods. 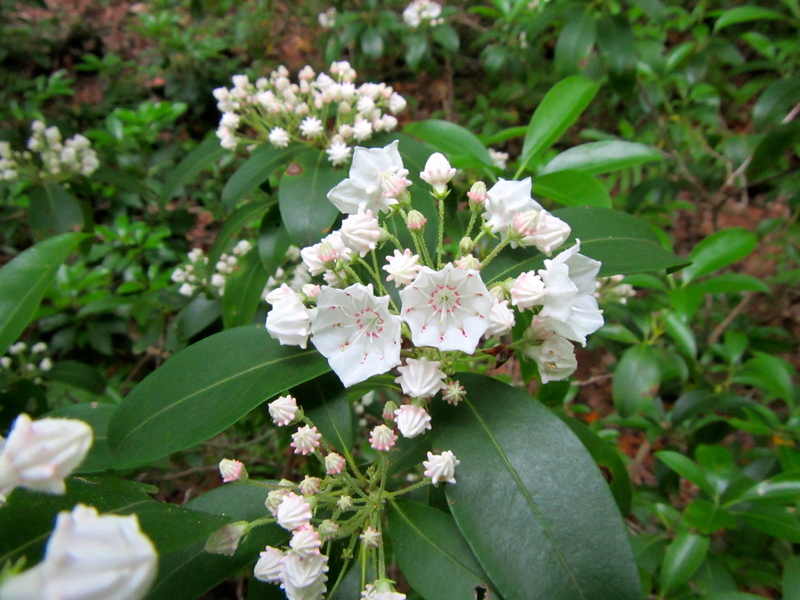 Our state flower, the mountain laurel, grows wild anywhere there’s shade. Some of the shrubs don’t produce flowers, but plenty of them were decked out in their white streamside finery. I spent the better part of the morning committed to the dry upstream cause, even though I knew it was costing me fish in some of the deeper pools. 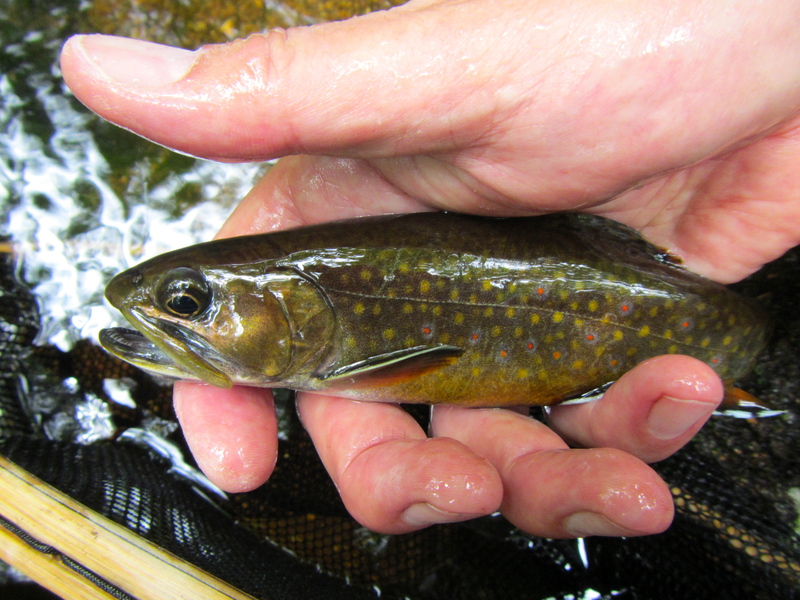 Most of the trout I raised were small — three inches or less — and very few of them were actually hooked. That was OK with me, though. Just to know they’re there tells me the brook is in fine shape, and those fish will be seven-inch lunkers in a few years. My best brookie of the day took a dry presented upstream in a dappled seam that rushed along the side of a large boulder. She ran all the way into the bottom of the next pool. Terrific little fighter, this one. One product of receding high waters is that the fish are spread out in the brook. 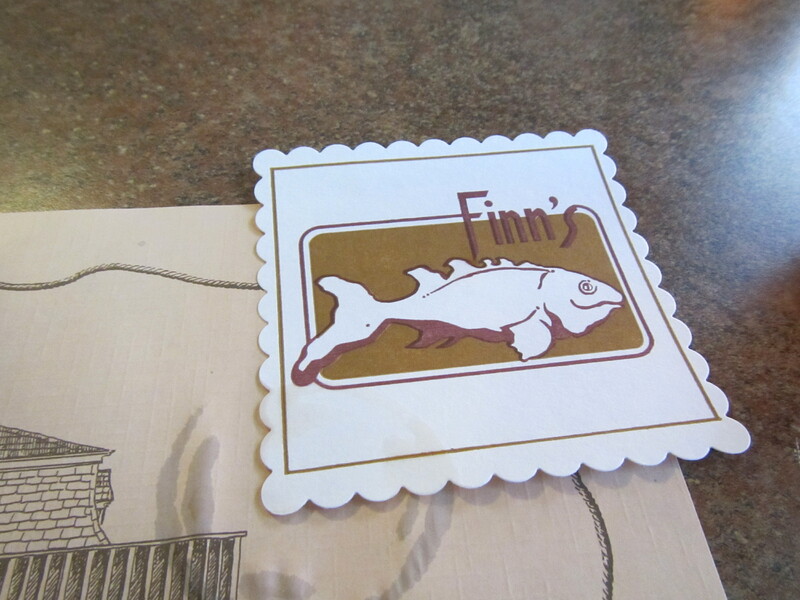 I found trout almost everywhere I went, including some places where I usually don’t. Many times I could see them bull-rush the fly (a size 16 Improved Sofa Pillow) as soon as it hit the water. When the water’s up like this, I like to plop the fly in the middle of a glassy micro-pond at the edge of a plunge pool or current seam. The brookies suddenly materialize from beneath the maelstrom, or the inky protective edge of underwater structure. I had a lot of first cast hits today. Not much going on hatch-wise: midges, mosquitos, and a few stay caddis. On the way out, I decided to take a page from my recent Upstream, Downstream, Small Stream article and fish a few of the deeper pools with a downstream weighted wet. The fly was a beadhead Grey Hackle Peacock, and among the trout that found it to their liking was a spiffy brown, who tracked the fly on the retrieve before striking. Halo, I love you. Nice brown, lousy photo. This is what happens when your good camera runs out of battery and you’re forced to go with a quickie from the phone. I was able to coax the better part of two hours out of this morning’s cigar, a Gispert Churchill. The air was still enough to blow smoke rings over dark waters, where the fishing was incendiary. High praise indeed. I’ve been fishing this fly with great success for years. So when creamy mayflies are coming off on the Farmington — or any river for that matter — the Light Cahill winged wet is usually the first fly I’ll tie on. There’s something about wood duck that states “buggy” and “alive” in no uncertain terms. I usually fish at least two of them on a dropper rig, and look to target specific rising fish. Trout will hit the fly on the dead drift (mend your rig like you would a dry) and at the drift’s end. Just let the flies sit there – and hold on. Some of the most violent takes I’ve ever experienced while trout fishing have come on this fly. Tying notes: Sometimes I tie this fly with a tail of wood duck or partridge, or substitute partridge for the hackle. Sometimes I’ll add a gold rib. While all these iterations work, the fly pictured here on a 2x strong hook is the one I fish the most. I like to keep the body sleek and tapered, so no dubbing loop. It’s a pretty straightforward tie, and you can crank out a bunch in a short time. 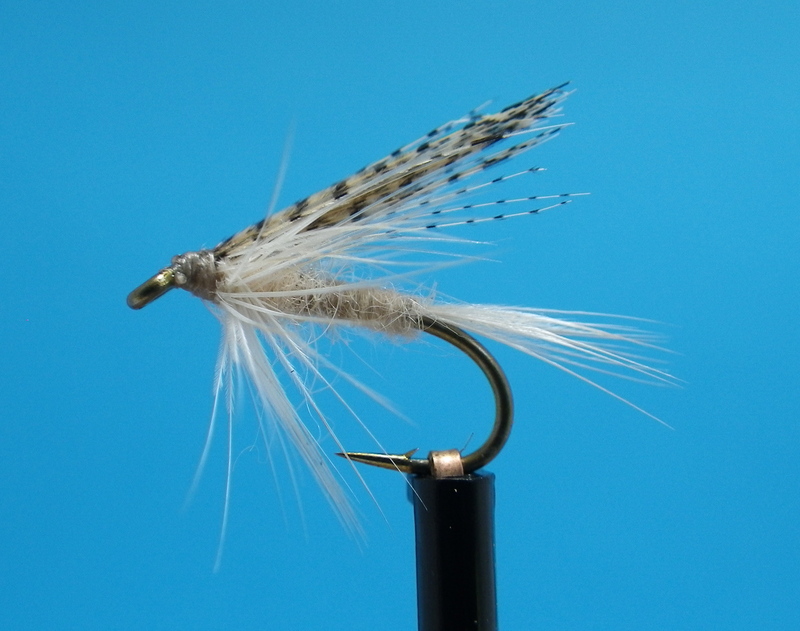 I’ve seen some versions of this fly where the hackle is clipped off the top half of the fly, but I leave it on. I tie the wing in last. 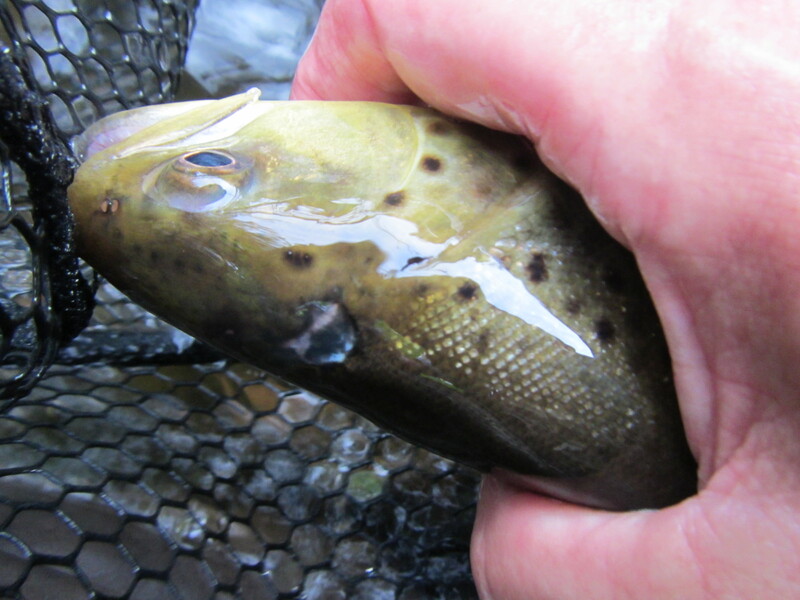 6/1/13 Farmington River report: Catch-and-release works. Fished the Lower TMA last evening from 6pm-8pm. I haven’t fished the lower river at close to a 1,000cfs in a while, and I was curious to see how some of my favorite spots fared in the higher water. It was still crazy humid, but the water was warm enough (67 degrees within a foot of the surface –don’t worry, it’s colder along the bottom) to defeat any notion of those classic Farmington River fog banks. Visibility was good, although there was still a light stain. My plan was to fish wets with an emphasis on Light Cahills (three fly rig from top dropper to point: Squirrel & Ginger, Partridge and Cahill, Light Cahill winged wet), but the hatch never materialized. I only saw two lonely creamy duns, a few stray caddis, and the omnipresent swarming midges. That last crew made me happy I had a cigar. Catch-and-release works. Some sporting bird of prey tried to drill a hole in Mr. Brown’s head, then had the decency to let him go. Fished a long deep run for about 45 minutes, waiting for a hatch that never happened. So I hiked upstream about 500 yards, and fished a series of rapids, walking, wading, and swinging the flies close to shore. 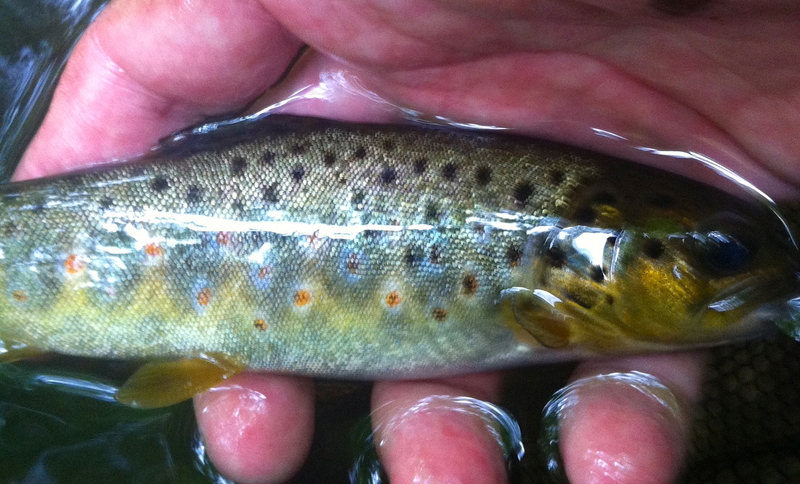 Took the bird-wounded brown above in that maelstrom, along with a JV Atlantic Salmon. Finished up in a deep pocketed run where I took a leaping brown on my second cast. Signs of good things to come? Sadly, not. One more courtesy tap, and that was it.